Malaysian cuisine encompasses a cocktail of different tastes and ethnic groups. The Malaysia food culture has heavy influences from the Malays, Indians, Indonesians, and Chinese. With the use and combination of aromatic ingredients such as cumin, coriander, and chilis, Malaysian food has a very full flavored taste. In this article, we’ll review the Top 10 dishes (in no particular order) that are so delicious, you have to try them when you’re in Malaysia. Originally coming from Southern India, Banana Leaf Rice is a traditional way of serving rice dishes. Various dishes are served on top of the banana leaf, so you have an assortment of foods to try. 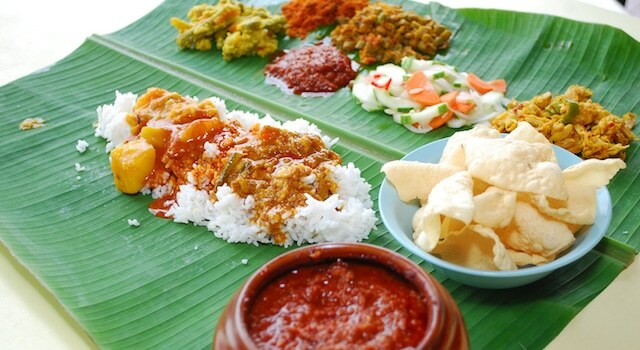 Typical dishes to eat on the banana leaf are white rice, chicken curry, assorted vegetables, tairu (fresh yogurt), papadam (crispy flatbread) and dried chilis. Also accompanied to the banana leaf rice may be rasam (sour and spicy soup), mutton curry and fried fish. 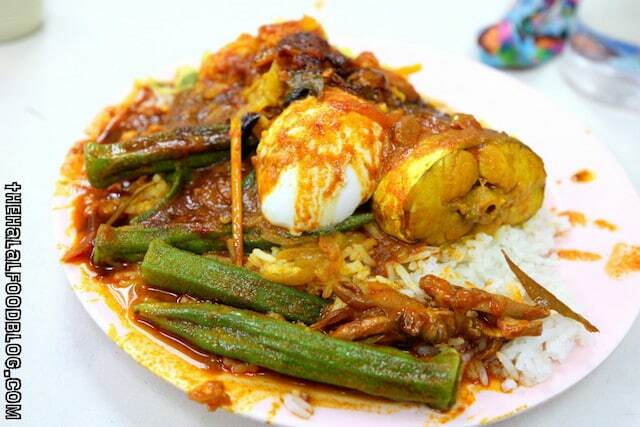 A well-known breakfast dish on the east coast of Malaysia, Nasi Dagang makes this top 10 list. 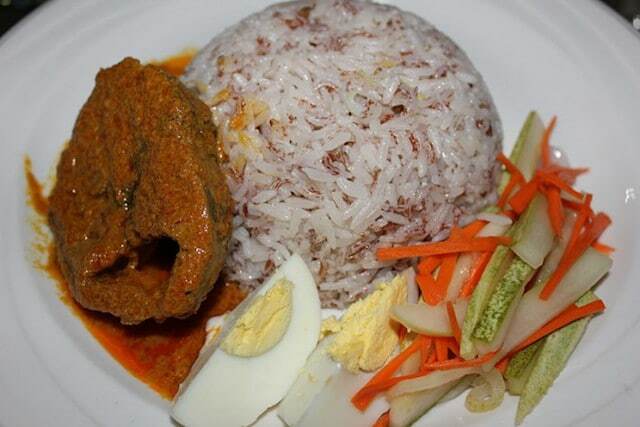 Nasi Dagang is a Malaysian rice dish accompanied with fish curry. Instead of cooking the rice in water, chefs will steam it in coconut milk to bring more of a sweet taste. The fish curry is also cooked from coconut milk but mixed with turmeric, lemongrass, galangal and chili paste. Normally tuna is the fish used in Nasi Dagang, but salmon and prawns are also sometimes added. Garnished with Nasi Dagang is fried coconut shavings, hard-boiled eggs, and pickled vegetables. Be sure to try Nasi Dagang for breakfast during your Malaysia food tour. 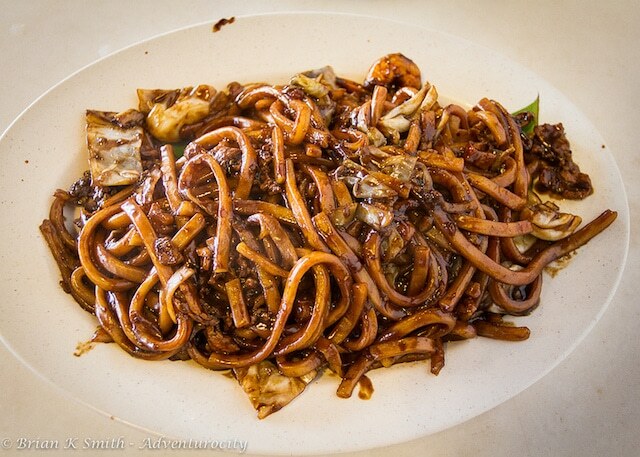 There are three different versions of Hokkien Mee. There is a stir-fried version from Singapore and the other is a broth-based from Penang. In this article, we’ll review the stir-fried version from Kuala Lumpur. Hokkien Char Mee consists of thick yellow or rice noodles which undergo a braising process in a dark and rich soy sauce. The key ingredient in this Malaysia food dish is crispy pork fat. Hokkien Char Mee isn’t the healthiest of dishes but it has an incredible flavor that is a must try! Nasi Kandar is a famous dish that originated in the north part of Malaysia, in Penang. In Malay, Nasi means rice, and Kandar is a traditional bamboo pole basket which vendors would carry around. Nasi Kandar is a meal that consists of steamed rice (or biryani rice), and served with an assortment of curries and side dishes. Some types of curries that may come with Nasi Kandar are mutton curry, ayam rose and squid curry. 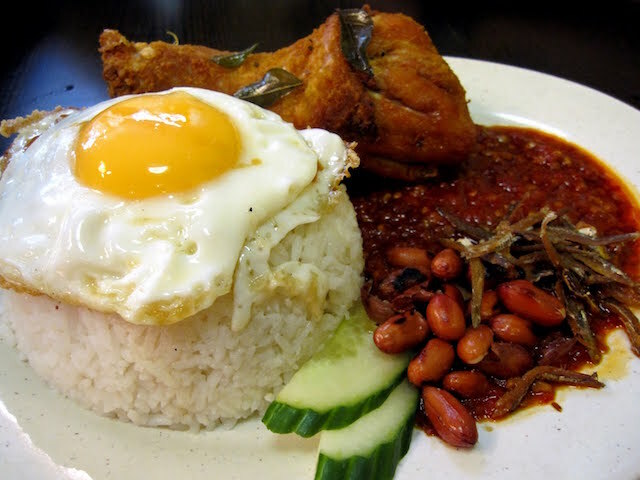 The national dish of Malaysia, Nasi Lemak, is a MUST EAT meal! The rice in this dish is soaked in coconut milk and cooked with pandan leaves. This gives the rice a very fragrant taste. There are many different variations of Nasi Lemak. Most Malaysian restaurants serve the traditional Nasi Lemak with a fried or boiled egg, and a choice of sambal cockles, squid, fish, or chicken. Normally, locals eat Nasi Lemak for breakfast, but it is not uncommon to eat it for lunch or dinner. It is very easy to find Nasi Lemak vendors in Malaysia, as this is a favorite amongst the locals. A very popular dish in the Malaysia food spectrum, Roti Canai bears a lot of Indian influences. Roti Canai is a type of flatbread that has savory and sweet variations. The sweet variation is usually eaten with a banana filling and condensed milk. However, people usually prefer to eat the savory version with dhal (lentil curry), or other types of curries. 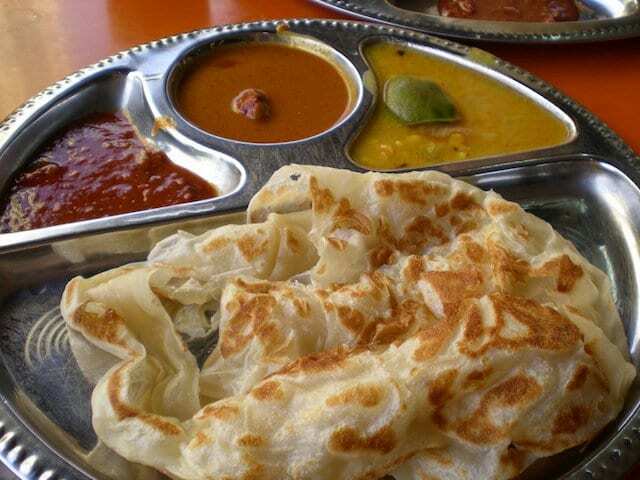 Many locals eat Roti Canai for breakfast, but people also eat it as a snack throughout the day. Sang Har Mee is probably the most expensive noodle dish you will find in Malaysia. 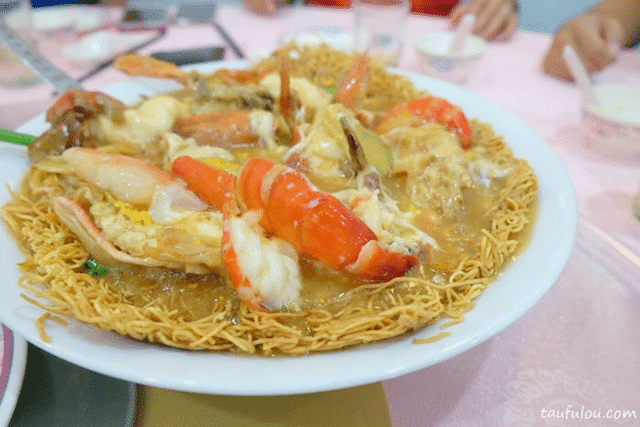 This Malaysia food special, features large freshwater prawns with crispy noodles, in a rich and creamy gravy. Cooks also and an egg to cook with the soup to bring added flavor. The awesome treat in this dish is the roe which comes from the prawn’s head. The prawn’s roe gives the soup a very creamy texture and rich taste. You’ll be able to find Sang Har Mee at various seafood restaurants throughout Malaysia. In Malay, Rojak means a mixture or a blend of something. Rojak is a spicy salad consisting of mixed tropical fruits and vegetables. Typical ingredients in Rojak are cucumbers, jicama, pineapple, rose apple and bean curds. Other variations may include cuttlefish, fried tofu, cruller, and crispy fritters. The heat from this dish comes from Sambal Belacan, a spicy sauce consisting of shrimp paste and chilis. Sambal Belacan is a common ingredient that you can find in many Malaysia food dishes. 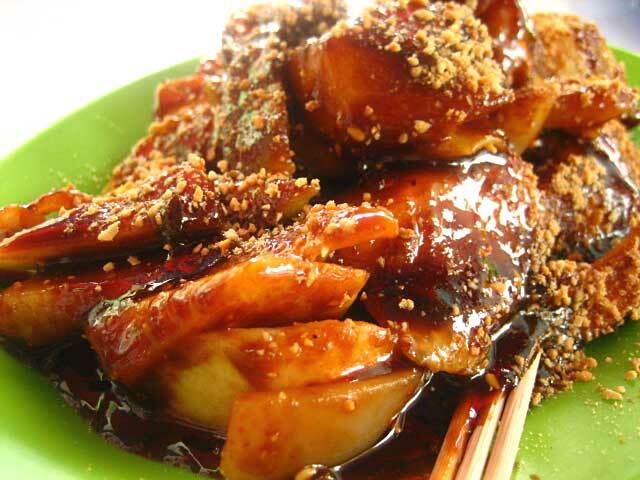 Rojak has incredible flavor and is a highly recommended dish to try! A very popular snack to eat throughout Southeast Asia is Satay. Satay is a meat skewer that grilled over a wood or charcoal fire. 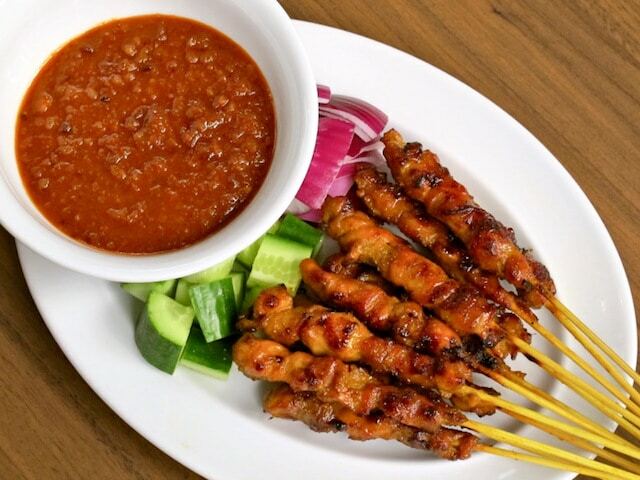 Meats typically used in Malaysia for Satay is chicken or beef. Before grilling, the meat will marinate in a paste that consists of shallots, lemongrass, garlic, ginger, coriander, cumin, and turmeric. The best part of eating Satay is the dipping sauce. A creamy and sweet peanut sauce is normally served with Satay, with a side of chili paste. The combination of the grilled meat and peanut sauce is absolutely delicious! Murtabak is a stuffed pancake or type of roti that originates from Saudi Arabia and India. However, it is also an extremely popular street food snack in Malaysia. In Arabic, Murtabak means folded, and that’s exactly what it is. A folded pancake. Most Malaysian restaurants will stuff their Murtabak with minced beef, chicken or mutton, along with onions, egg and garlic. Murtabak has a very savory flavor and restaurants sometimes serve it with a curry style gravy. 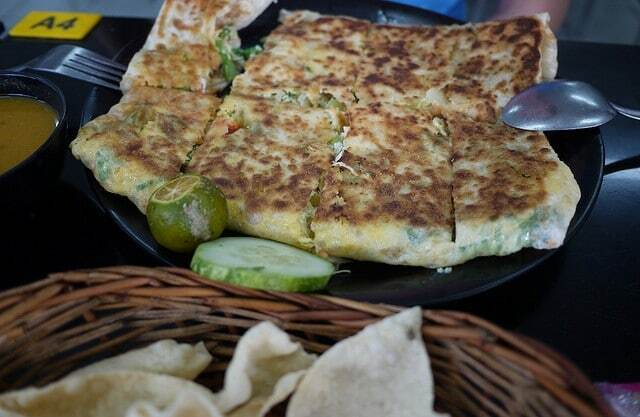 You need to try Murtabak when you’re visiting Malaysia!